When approached to create Alba’s Cleaning Services logo, the client made it clear that the final product was to portray a clean, simple and professional concept design. We focused on a vibrant icon design that was easily identifiable upon first glance . 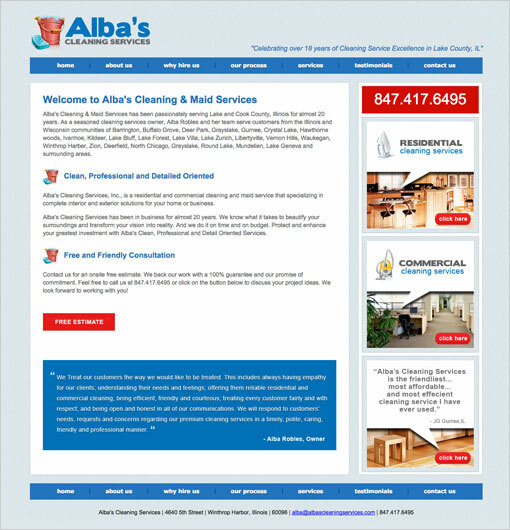 Alba’s Cleaning Services needed a fresh, clean and eye-catching web design that would appeal to their home and business target market. SEO was a key component to the website as new business was the primary objective. Because Cleaning and Maid Service business are so prevalent in the marketplace, numerous page #1 rankings on Google was a must have.